I used one piece of patterned paper for this 6x8 layout - the front, back and branding strip. I dug into my stash of Ali Edwards Story Kit embellishments and finished off with some washi tape and wood veneer. Journaling reads: Suddenly nine months have all but disappeared and soon - just days now - we get to meet you. I'm full of emotion - anticipating that incredible moment when they place you in my arms, but also wondering about the changes and challenges you will bring to our lives. Life will forever change when we meet you & fall in love. 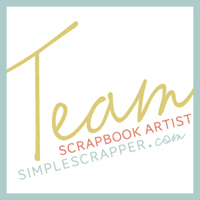 When I saw the sketch templates from Simple Scrapper's February collection, I had an idea immediately come to mind. A cut file purchased from the Silhouette Design Store (and some wrangling to get the file to download) later, I had the basis for a simple and striking layout. To fit the corner of the 6x8 layout I sized the photo to be pretty tiny - 1.5 x 2 inches - but that seems perfect from a blokeh photo of my Christmas tree. To not overwhelm the small photo I cut the wreath from the same dark colour as in the photo. A few gold sparkles are the only embellishment needed. I have become the worst blogger. I didn't mean to, and I don't want to be, but neither change the fact that I have posted a grand total of 18 photos so far this year. 18! In 2015, pre-daughter and photography business, it was more like 400. There are so many stories I'm not telling, on paper or blog, and I really want to. So, I'm going to start by sharing the few layouts I have made this year, as prompted by my Simple Scrapper Team Member obligations. At least SOMETHING has kept me creating! I used a sketch template from Simple Scrapper's November membership collection as the basis for this December Daily page layout. I have a painting that accompanies this story and photo, so I created the layout on a clear transparency. The patterned paper and photos are placed on top of the transparency but still allows peeks through to the painting beneath. In all honesty progress on my December Daily album is somewhat stalled, however I did use a Sketch Template from Simple Scrapper's June membership collection to create this 6x8 layout for Day 14. The patterned paper is all out of a 6x6 set from Elle's Studio. This layout was based on a sketch from the Simple Scrapper March membership collection. It's just a simple list of things I am loving right now. I printed my journaling onto white cardstock and cut a title from the same cardstock for a subtle effect. The 3x4 card and chipboard tab are from an Ali Edwards Story Kit and the background paper, onto which I sewed the cardstock, is from Elle's Studio. The photo is my little family on Christmas morning. How sweet is Milly's grin! This layout was inspired by a sketch template from the Simple Scrapper November membership collection. I love this patterned paper from Crate Paper and it seemed perfect as the background, but with such dark photos I was really battling with the layout seeming too busy. Layering vellum over the background helped tone it down while allowing those cute houses to still show through. Prompted by the November Simple Scrapper Story Starter theme of Getting Stronger, I turned this previous blog post into a scrapbook page. Well it's a 8.5x11 double page spread, so scrapbook pages. I didn't intend to create a digital layout but with a favourite photo I wanted to showcase and a large amount of text, I played around with a few different hybrid designs before realising I should go REALLY big to make the most of the background space in the photo. I'll separate the layout into the two 8.5x11 photos before sending it off to print. I did keep an eye of that middle margin and the title fits safely on the right side. Pretty darn pleased with this one!